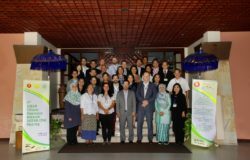 BANGKOK, Thailand – Government representatives of ASEAN Member states joined a five (5) day training to increase their skills in preparing fundable project proposals for climate change adaptation. Participants learned how to engage in or supervise the preparation of a bankable climate change adaptation projects that effectively address the most important adaptation needs while at the same time attending to the goals and requirements of specific financiers. The training covered: a) prioritizing adaptation needs according to environmental and socio-economic criteria; b) identifying financing sources and their respective requirements; c) understanding and complying with fiduciary requirements of financiers. The ASEAN Climate Resilience Network (ASEAN-CRN) facilitated the participation of officials from the ministries of Agriculture of Laos, Philippines, Thailand, and Vietnam. Prior to the start of the training, the participants were requested to prepare a concept note for a potential climate change adaptation project that their respective institution would like to submit to a financing source in the near future. In order to shape those concept notes into bankable proposals and to ensure that the requirements of potential financiers are met, resource persons from the training institute have provided feedback. They then worked in country groups to develop a “roadmap” for moving from project concept to a project design document. This could later be developed into a full-fledged proposal to access suitable sources of financing from both domestic and international options. The Philippine group, composed of Mr. Norman Cajucom, Philippine Crop Insurance Corporation (PCIC) Senior Vice President, and a representative from the Climate Change Commission, worked on the concept note “Financial Assistance to Philippine Agricultural Insurance Program, for Subsistence Farmers and Fisherfolk Vulnerable to the Negative Impacts of Climate Change” for eventual submission to the Green Climate Fund (GCF) and the Adaptation Fund. “The training was very productive and fruitful. The comments and suggestions of the experts will guide us in further developing our concept note, especially on how to proceed with our goals of accessing funds from financiers. When I get back to the Philippines, I will discuss and share the lessons learned from this training to the focal persons of our linkages”, Mr. Cajucom said. Likewise, Mr. Dinh Phan Hien from the Vietnam International Cooperation Department (ICD) said that the training helped him to easily understand how to prepare a concept note following the requirements of funding sources, particularly the GCF. “I will apply the lessons learned from this training in my daily work not only for proposal development on climate change adaptation but also in other topics, as well as share this knowledge to my colleagues”, he added. The training on “Managing Project Preparation for Climate Change Adaptation”, which was held on 16–20 January 2017 at the at United Nations Conference Centre (UNCC) in Bangkok, Thailand, was conducted by Climate Change Asia (CCA) under the Asian Institute of Technology (AIT) Regional Resource Center for Asia and Pacific – together with the United States Agency for International Development (USAID) Adapt, and the United Nations Development Programme (UNDP). 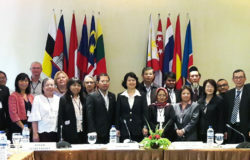 Participants from seven (7) ASEAN member states, namely Cambodia, Indonesia, Laos, Myanmar, the Philippines, Thailand and Vietnam, who are responsible for planning and financing, and design and implementation of climate change adaptation projects in their respective countries attended the training. The ASEAN Climate Resilience Network (ASEAN-CRN) provides as a platform for promoting climate resiliency through exchange of information, expertise, and experiences on climate smart agriculture amongst ASEAN member states. 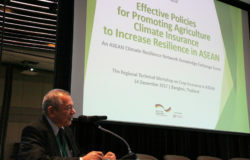 The ASEAN-CRN is being supported by the Forestry and Climate Change (FOR-CC) project under the ASEAN-German Program on Response to Climate Change in Agriculture and Forestry (GAP-CC), which is funded by the German Federal Ministry for Economic Cooperation and Development and implemented by Deutsche Gesellschaft für Internationale Zusammenarbeit (GIZ) GmbH in close cooperation with the ASEAN Secretariat (ASEC).